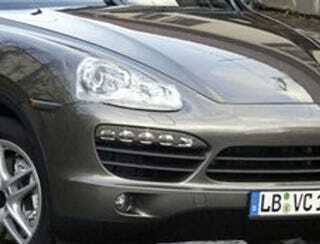 Autocar's snagged spy photos of the 2011 Porsche Cayenne wearing only some small pasties over its lights and badges. What do they reveal? A less aggressively-styled SUV that may be lighter than the outgoing model. Like the current model, the new Cayenne will share its platform with the VW Touareg, the 2011 VW Touareg is scheduled for a Detroit Auto Show unveiling next week while the Cayenne is scheduled for the Geneva Motor Show in March.